If you want to use fonts that aren't included in PowerPoint, you can get more font sets from third-party vendors by searching the web. If the font comes in a compressed .zip file, right-click that file and select Extract All. The file is uncompressed and saved to your computer disk. Right-click the font file and select Install. The next three steps let you confirm that the font has been installed correctly. Open Windows Control Panel and search for font. Select the Fonts control panel. In the control panel, you'll see a list of all the fonts installed on your computer, including the one you just installed. If PowerPoint was open while you installed the font, close and re-open the app. The font is now available in the Font lists on the ribbon in PowerPoint. To apply the font to particular text, select the text and then select Home > Font and select the font you want. Double-click the font in the Finder. In the font preview window that opens, select Install Font. After your Mac validates the font and opens the Font Book app, the font is installed and available for use. You download third-party fonts at your own risk. 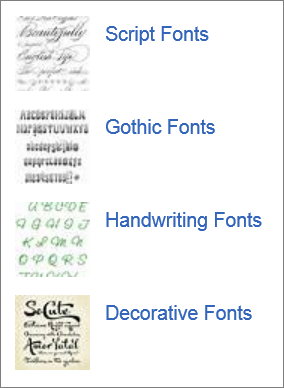 There are many legitimate sites where you can purchase fonts. However, some vendors don’t allow you to embed them. (Licensing rights determine how or whether a font may be embedded in the document.) This can be a problem if you’re planning to send your presentation to others who don’t have these fonts installed. They won’t see the fonts you’ve carefully selected. Instead, they’ll see a substitute font that they have on their computer. While there are free fonts sites on the web, some fonts are incomplete sets, and others might conflict with fonts you already have on your computer.